President Duterte has offered China conciliatory talks on a long-awaited international tribunal ruling over Beijing’s maritime claims, a week before the verdict. Duterte, who was sworn into office last week, said he was optimistic that the UN-backed tribunal in The Hague would rule in favour of the Philippines. “If it’s favourable to us, let’s talk,” Duterte said in a speech before the Philippine Air Force at the former US military base of Clark. Prior to the election, the self-styled “Punisher” had boasted that he would ride a jet-ski to the disputed islands and reclaim them personally. An international tribunal will rule on July 12 in a case the Philippines brought challenging China’s claims to most of the strategically vital South China Sea China sea, that extend close to the shorelines of the Philippines and other Southeast Asian nations. China has said it would reject the ruling and refused to recognise the Permanent Court of Arbitration’s jurisdiction over the issue. Duterte has said he wants friendly relations with China, a departure from his predecessor Benigno Aquino who angered Beijing by launching the legal action and strengthening ties with the Philippines’ longtime ally the United States. 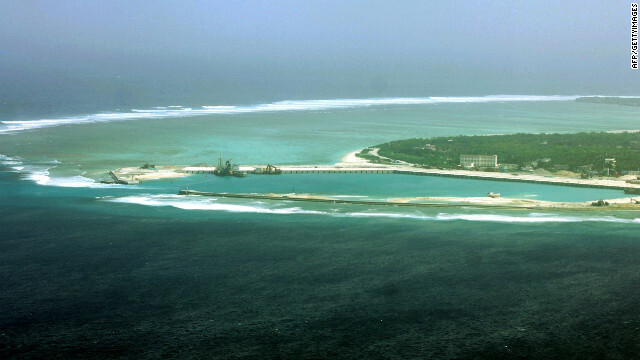 Aquino’s government argued that China’s claims to most of the South China Sea and its island-building program in the disputed waters violated international law. Aquino had refused to hold direct talks with China on the issue, pointing to Beijing’s insistence that its claims were indisputable and thus there was nothing to negotiate. Aquino had also feared negotiations would disadvantage the Philippines, which has far fewer diplomatic resources. In contrast, Duterte had previously said he was open to talks with China, and even joint ventures to share resources in the sea. But Tuesday’s comments were the first since becoming president confirming he was open to talks, which have long been favored by China because of its perceived advantage. After assuming the presidency, Duterte had said that he would not “taunt or flaunt” a favourable ruling. Ahead of the ruling, Chinese President Xi Jinping said Beijing was “not afraid of trouble” while state-run media urged China to prepare for “military confrontation” in the disputed waters. Duterte on Tuesday reiterated he was against any armed conflict. “We are not prepared to go to war. War is a dirty word,” Duterte said. He added that even if the tribunal rules against the Philippines, his administration would accept the judgment. The sea is the main maritime link between the Pacific and Indian oceans, where over $5 trillion in ship-borne trade passes annually. Taiwan, Vietnam, Malaysia and Brunei also have overlapping claims to the waters, which are believed to sit atop vast mineral reserves.